(Host) Vermont got its first presidential visit in 17 years today. President Obama noted that no other state has gone so long without a presidential appearance. (Obama) "So we decided that today, we are going to reset the clock." 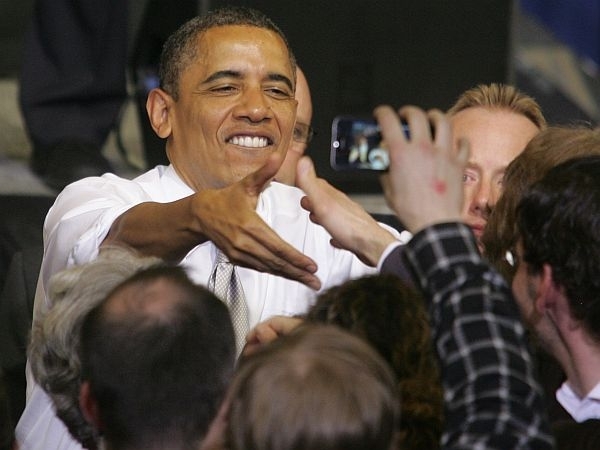 (Host) The President spent a little more than four hours in the state to headline two fund-raisers. VPR’s Kirk Carapezza was at a rowdy rally at the University of Vermont. (Carapezza) President Obama got a resounding welcome from the 4,500 supporters who paid at least $44 apiece to crowd into the UVM athletic complex. 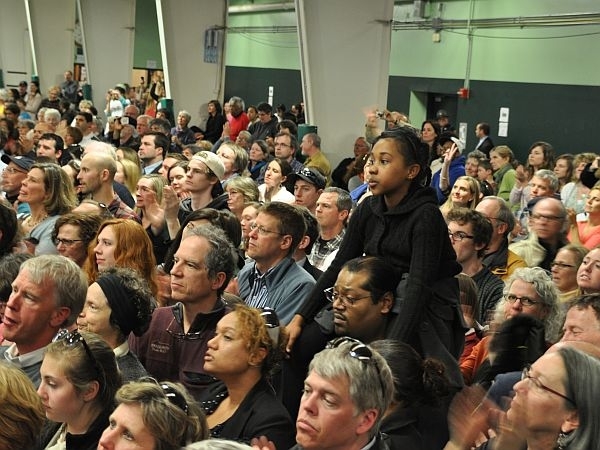 (Obama) "This is a good crowd here in Vermont." (Carapezza) Vermonters have waited a long time for this. President Obama’s visit to Vermont was the first by a sitting president since Bill Clinton was here in 1995. The President said his supporters have only just begun to see what change looks like, and he highlighted what he calls the signature bill of his term in office. (Obama) "Change is the health care reform bill that we passed after over a century of trying." (Carapezza) The Supreme Court has dissected that bill this week, and will decide whether it’s constitutional. President Obama says health care is a basic American right, and he laid out what he says is at stake in this election. (Obama) "That’s what we’re fighting for. That’s the choice in this election. This is not just your usual run-of-the-mill political debate. This is the defining moment of our time – a make or break moment for the middle class. That’s what we got to fight for." (Carapezza) In these stump speeches, Obama is full of optimism about the economy and he says his administration is still prepared to restore it. He reprises the promises he made during his 2008 campaign. (Obama) "I’ll never be a perfect president. But I made a promise to you then: That I would always tell you what I believe, and I would always tell you where I stood and I would wake up every single day fighting as hard as I know how for you. And I have kept that promise. I have kept that promise. I have kept that promise. So if you’re willing to keep pushing with me – through all the obstacles, through all the naysayers, if you’re willing to keep reaching for that vision of America that we all have talked about, that commitment you didn’t just make to me or I made to you but we made to each other – I guarantee you change will come." (Carapezza) Candidate Obama is known for rhetoric like that. Many of his supporters in Vermont who are relentlessly optimistic have come to terms with the contrast between President Obama’s governing record and Candidate Obama’s call for radical change. Attorney Kimberly Cheney came from Montpelier and paid hundreds of dollars to see the President in person. Cheney says above all, in these tough, polarized times, he came to hear Obama’s stump speech for inspiration. (Cheney) "It means to me that he embodies what he said – that he worked his way all the way to the top of the political pile while facing discrimination and he’s a magnificent leader. (Carapezza) And the majority of Vermonters agree. A poll shows while the President’s approval rating has slipped nationally it remains strong in this bluest of blue states. The president’s two fundraisers produced an estimated $750,000 dollars for his campaign and the Democratic National Committee.